One of the biggest challenges with hahstag printing is getting people to participate. No matter if you are working at a wedding or corporate event, getting the word out to guests that they can tag their photos on Instagram or Twitter and have them immediately printed out is half the battle. Encouraging people to use your hashtag printer just got easier with Contest Mode for BYO Booth. 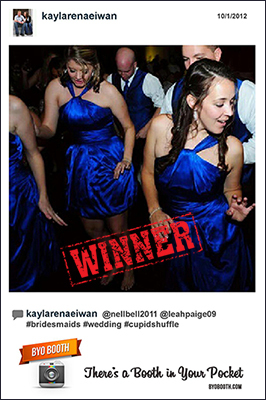 Contest Mode has been a very popular feature in our photo booth software, Social Booth for quite some time now, and it has been one of the most popular requests for inclusion in BYO Booth ever since it was first added. So what is Contest Mode? Basically, it allows you to define a 2nd template that gets printed x% of the time. Think of it as a winning ticket that you can define how often it gets used. So now you can offer prizes to encourage people to hashtag their photos. Simply set BYO Booth to use the winning template at your desired probability and get ready! Check it out in here in BYO Booth.